Folk-rock trio THE EDNA PROJECT will present a unique concert, “Edna St. Vincent Millay’s Poetry Set to Music” at the Strand Theatre, 345 Main Street, on Thursday, June 21 at 7pm. Proceeds will benefit the restoration of the Edna St.Vincent Millay Birthplace in Rockland. THE EDNA PROJECT (wife and husband Liz Queler and Seth Farber, with son Joey Farber) are two-time grammy nominees perform an eclectic melding of folk, bluegrass, rock and jazz, presented with humor and outstanding harmonies. They have brought this performance to museums, libraries, clubs, concert halls and festivals, including Newport Folk and Alice Tully Hall (Lincoln Center). The concerts include projections of Millay, her home and artifacts, and her poems. The project was born when Liz, frustrated by writer’s block, opened a volume of Millay’s poetry and decided to compose music to the lyrics she read. 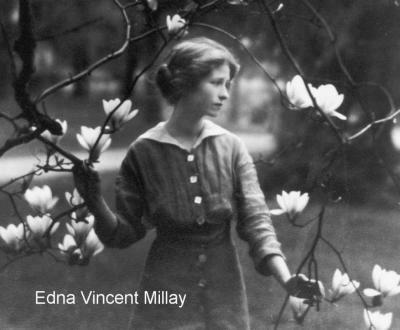 Soon enthralled by the life and works of the unconventional, bohemian Millay (1892 - 1950) Liz immersed herself in Millay’s world and was inspired to create The Edna Project along with her husband Seth. Hailed by Billboard Magazine as “a singer's singer”, Liz Queler (vocals/guitar/mandolin), a native New Yorker and the daughter of renowned opera conductor Eve Queler, has performed on esteemed stages from the Newport Folk Festival to Carnegie Hall. Her voice and compositions have been heard on countless jingles as well as TV and film soundtracks. Seth Farber (keyboards/accordion/vocals) was musical director to the late, great Odetta for ten years, producing three CDs, two of which were nominated for Grammys. He was also assistant conductor at the Broadway musical "Hairspray" for it's 6 year run. Joey Farber is fast amassing his own impressive credits, boasting 3 national jingles, an off Broadway show (Soul Doctor), and appearances on Saturday Night Live, and Late Night With David Letterman. Both Liz and Seth currently tour with Grammy nominated children's rock band "Brady Rymer and the Little Band That Could." Along with their son, Joey, they were featured on Rosie O'Donnell's HBO special "A Family is a Family Is A Family." Proceeds from the performance will benefit the Rockland Historical Society’s project Saving A Literary Landmark - Restoring the Edna St. Vincent Millay Birthplace.